First, make sweetened sour cream by mixing 2/3 cup milk, 1/3 cup cup sour cream and 1/4 cup caster sugar in a blender. Add 2 tsp of kirsch or vodka, mix to combine and leave in the fridge until show time. Separately, whisk together 1/3 cup triple sec with 1/4 cup caster sugar and zest of an orange until the sugar dissolves. Stir in 2-3 cups of mixed berries, turn a few times to coat the berries in liquid and leave to marinate in the fridge. That's it; your prep is done. If you have a cheap ice cream maker like I do, you will probably also need to make sure that the bowl is sitting in the freezer at this time. All you do at dinner is take both the bowls out. 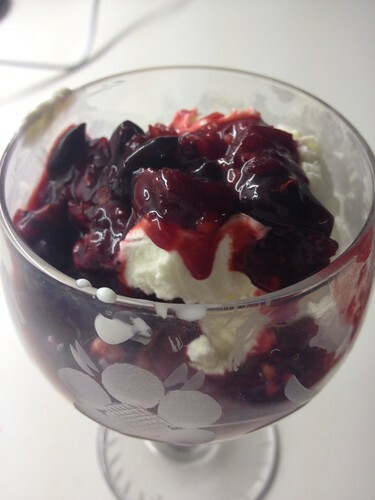 Churn the sour cream in the ice cream maker for 5-10 minutes until its frozen, scoop it out and top with berries. This looks delicious. I can see where sour cream would make a fabulous base for icecream!